If you love watching landscape drawing lessons, this video selection shows how easy it is to portray beach scenery. Fortunately, I found an artist on Youtube who has a brilliant way of explaining how to achieve certain effects in drawing. I casually created the displayed drawing in stages, as I followed the advice given. Along the way he shares what drawing supplies are being used and why. I like this guy - he gives very simple instructions that are easy to follow along with some really great tips! Below there are a total of 5 videos, all by the same artist. Parts 1, 2 and 3 take you through each process step by step. 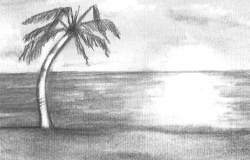 The 4th video shows you how to draw a palm tree and lastly, you see a speed video (no voice over). It's good to watch in sequence and to see how all the elements come together. 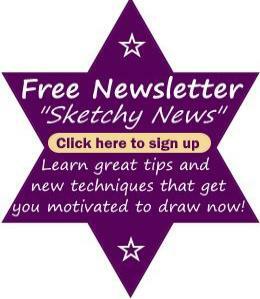 Life just can't get better while you have these free online art lessons at your disposal. While you are learning how to draw clouds, listen carefully because the artist shares interesting tips and techniques. You've probably heard a million times to never put your fingers on your drawing paper but this artist clearly has no inhibitions about doing whatever he wants. Heh, this guy is after my heart because us hobby artists have no rules either. Be aware though, that skin leaves an oily residue on paper which eventually goes yellow, hence wrecking the appearance of artwork over time. I became so enthralled watching these landscape drawing lessons that I completely forgot to draw! No harm done though, luckily there is a replay button :). Now you know how easy it is to draw clouds! It's great, hey? Let's progress on down to the 2nd video. This follow up tutorial shows how to draw the ocean. I hope you are enjoying following along with the landscape drawing lessons. Next you will see how to add the sand - it really is so simple when you know how. In this video, notice how he turns the paper around which makes it easier to draw with the flow of the wrist. The palm tree is added in last so I was happy to see the addition of a spare piece of paper under his hand to protect the established drawing. I love following the steps and listening to the artist. Notice how this fellow says "looks good enough to me", well, that is all you have to do, too - draw something until it looks right to you! You are drawing because you love it, so always please yourself first and just draw from your heart. If it suits you better, just pause each tutorial at regular intervals so you can copy along at the same time. Up next is a speed drawing of a beach. Now that you've watched the process in stages, this video shows how to put it all together. Notice how the sun is depicted in the drawing, it's not represented by a circle which many people tend to do. Turn your speakers off if you don't like the music, there is no voice-over in this video. So now you have a better idea of how to put a drawing together. My thanks goes to Artist Pinsetter 1991 who has made it look so easy and he unselfishly shared a gazillion tips along with his time. "It is the stuff left out and not what is put into a drawing which makes it good." When you don't overcrowd a drawing, you invite a viewer's imagination to conjure up a story or interesting outcomes. When you portray a view and include only what attracts you, your artwork shines with your personality. I thought these landscape drawing lessons were really easy to follow and the fact that they are free is an added bonus. Now you can go ahead and apply this new knowledge to all your future drawings - I wish you well.